Dragons have become quite a fad lately. We’ve got Khaleesi’s formidable trio of dragons in Game of Thrones, the nasty, evil one voiced by Benedict Cumberbatch in the Hobbit and friendly creatures in Dreamworks’ How to Train Your Dragon series. Popular culture cannot get enough of them. What better time to launch an entire slot around this fantastical beasts? Microgaming has dreamed up a colourful dragon family in Dragonz (with an edgy Z). There are four dragons in this squad – Flint, Frost, Switch and Gobble. Instead of plain old breath of flames, these dragons spit out flaming wilds, frosty wilds, winning wilds and stashed wilds too. Not to mention, all of these wild symbols accompany a flurry of extra spins, which are every slot player’s best friend. You and your wallet will simply enjoy this party. Dragonz accepts bets between 40p and £30 per spin. That being the case, this slot may turn away players who prefer playing 10p spins. The generic 10, J, Q, K and A symbols form the usual low-paying slot symbols. Then, there’s the four dragons, an orange wild symbol and a purple-coloured scatter symbol. There are 243 ways to win on these reels, which is a lot for a slot by any measure. As long as the similar symbols appear in at least three consecutive reels (from left to right), you’ll pocket cash. You can win for multiple symbols in a single spin. The paytable promises up to £107,500 max win per spin, pushing the game straight into the list of slots with huge payouts. I’d say it’s a medium volatility slot, meaning that it offers frequent small wins as well as good helping of top prizes. This ensures that you can play for longer and build up a sizeable casino balance. The game is configured to payout 96-97% of all wagers accepted to its players; this is an average rate calculated over a large number of spins. From what we heard, Microgaming employed their latest, cutting-edge 3D animation suite in the production of this slot. And the results are absolutely stunning. Dragonz has a rather cinematic quality about it. I’d go so far to say that it is the most beautiful slot that has ever come out of Microgaming studio’s doors. The characters, game backgrounds and animations are fit for a Hollywood blockbuster film, or at least one of those family-friendly cartoons. Microgaming even promoted the game as if it were a movie, releasing short trailers of the dragons flying around rather than the reels in motion. Casinos must have had a blast decorating their lobbies with stills of these four spunky dragons. Game Features: Four Dragons, Four Different Features! There are four friendly beasts in Dragonz, each with their own quirks and extra spins bonus features. Their names are Flint, Switch, Frost and Gobble. All four dragons offers 10 extra spins when you score three or more purple jewel scatter symbols on the reels. However, each dragon’s extra spin games are characterized by the dragon’s special powers and distinctive personality. Flint is, as his name suggests, the fiery one of the bunch. He sets the reels alight by fires firing wilds onto the reels during his extra spins and having them land randomly across the board. Frost does quite the opposite. His frosty wilds will stay frozen in place wherever they appear, only to disappear after they are used in a win. It is quite a sight when multiple Frosty Wilds cover the board, producing a giant huge win at just the right moment. Gobble, the squat green fellow, spits gooey green slime all over the board, which produces this delightful wild called the winning wild. These wild symbols are guaranteed to create a win on whichever payline it lands on. Finally, there’s Switch. Switch collect wilds from non-winning spins and stashes them away at the bottom of the board for future use. Once you’ve collected at least three of these Stashed Wilds, Switch throws them back on screen and guarantees a win on your next spin. As you can probably tell, all four dragons do well in delivering wins and thrills to players. The game randomly determines which of the four dragons you’ll meet each time you trigger the bonus games. However, once you’ve triggered the bonus games 12 times, you’ll unlock the player’s choice feature and get to choose which of the four that you’d like to play. By the time I unlocked that, I grew to like Gobble as he always gave me a little more cash than his siblings. Anyway, once you’ve played the bonus games 12 times, you’ll easily choose your favourite dragon too. This feature follows the upcoming trend of slots that reward players for loyalty. The longer you play, the more richly you are rewarded. On top of the free games, there is also a Wild Deal feature. If you have a wild on reel 3 but did not receive a win on that spin, you’ll get extra wilds dealt on the other reels to create a guaranteed win. It appears as a random act of generosity from the casino, as well as a cheeky bait to keep you playing longer. Whichever it is, I much prefer this to games that give nothing at all during boring no-win streaks. Dragonz — Four personalities in one game! What I love most the Dragonz slot is how each dragon has its own distinctive personality. Flint is the alpha male of the pack, with the arched brow, tongue stuck out and proud flights across the sky/screen. Gobble is the hungry one, the comedic relief of the squad. It’s delightful to watch him belch green slime all over the reels. Each dragon’s bonus games are also set in their own lands. Fiery Flint’s games is set in the typical dragon’s land – rocky beach and clear blue skies. Switch, the rock-and-roll dragon lives in a purple-coloured fantasy land. Switch is so edgy that electrifying sparks fly when her Stashed Wilds discharges and produces stellar wins across the board. Naturally, Frost’s games are set in the world of ice and snow (because no frosty character could party on the beach, much to Olaf the Snowman’s disappointment in Frozen) while Gobble trudges about in lush tropical forests. Dragonz: Four different dragons, four different extra spins! Dragonz In my humble opinion, extra spins are the secret to a slot’s success. It is always so fun as a player to have extra spins conjured up in new and imaginative combinations. My heart races as the reels turn and I hold my breath as I wait for the symbols to line up in just the right arrangement. Every win is sweeter than the regular wins in the base game because they are, well, free! 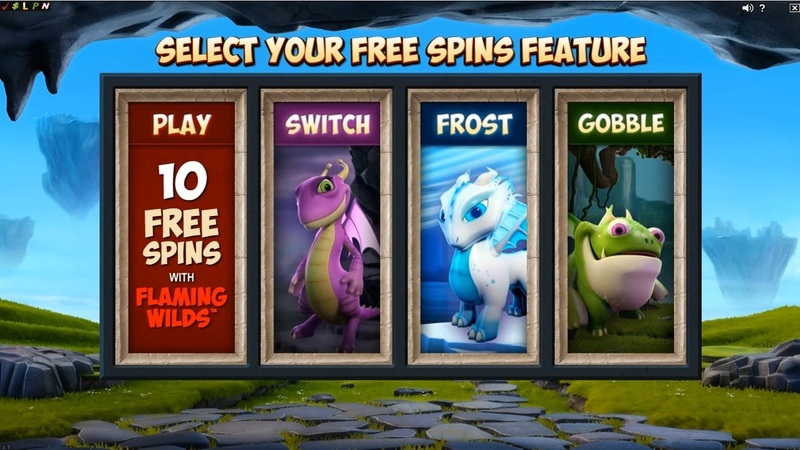 Having four different dragons serve up extra spins with four different features just adds to the fun. Besides shaking things up each time, the game has me staying for longer because I want to meet every dragon myself. I just need to know whether the next dragon is more generous than the last. The Dragonz slot launched on both desktop and mobile platforms, at all Microgaming casinos. You definitely do not want to miss out on this slot masterpiece. If Dragonz is an indicator of where the slot industry is heading in 2017 – high quality graphics, innovative features and compelling storyline, players will have much to celebrate.